This article is a bit late. No wait, it’s hideously late. But I was bored and I’ve always wanted to make a top four XI, especially considering I did a relegation XI. But doing a top four XI is tough and controversial. On one hand there is no Chelsea, as they didn’t finish in the top four. But on the other hand the Blues have only gone and won the Champions League, so you ask yourself do I consider the Chelsea players or do I leave them out? These are the questions that keep me awake at night..
Well, for the sake of the challenge, I have decided to keep Chelsea out of it. Now Chelsea fans, don’t be hurt, I have done this as I wanted it to literally be the Top Four XI. For me, the keepers argument is quite simple. It’s gotta be Joe Hart hasn’t it? He is the man, he makes goalkeeping look cool. But in terms of football, he has been fantastic. Hart is incredibly well rounded, focused and often saves his team’s bacon countless of times. But what impresses me about Hart is his leadership and organisational skills. He really settles and calms Man City’s backline, the understanding between him and his defenders is fantastic and is visible to anyone who watches City. Again, this area is relatively straight forward for me. Although he didn’t feature as much as expected last season, I do feel Bacary Sagna is the best right back in the Premier League. A few months ago, I did an analysis on right backs here. 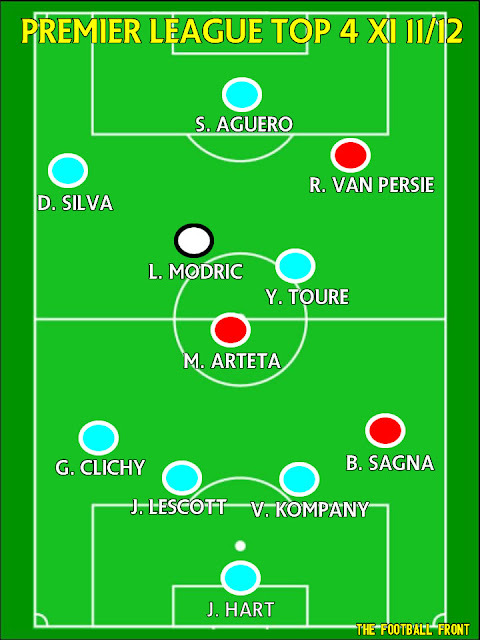 And Sagna dominated over a number of leading right backs in the Premier League. Sagna offers something many full backs crave, and that’s balance, in terms of offensive duties and defensive duties. Sagna’s great positioning and reading of the game allows him to roam forward and defend adequately. This is tough, probably because most of the top four have very gifted centre backs. Looking at the stats, im going for Vincent Kompany and Joleon Lescott. Now, I know it’s dead boring and is a bit like someone having the chance to pick anything to have for dinner and they go for the old routine of bangers and mash. But these two are pretty good and cover a lot of bases. Kompany is arguably the best centre back in the Premier League. 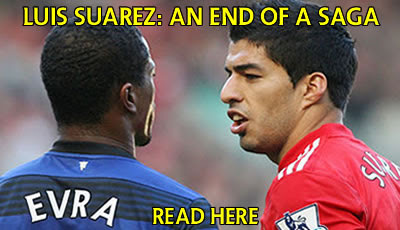 He dominates his opponents; he wins most of his tackles and reads the game very well. While with Lescott, we have a left sided centre back, who is a tackling specialist. Lescott is dominant in the air too. This is an interesting one to call. If Chelsea made the top four, Ashley Cole would certainly be up there. But even so, it’s still a hard question. A few months ago, I also did an analysis on some left backs in the Premier League, and Gael Clichy really impressed me. Like his former Arsenal team-mate Sagna, Clichy is well rounded in regards to his offensive and defensive work. But my one issue with Clichy is that he doesn’t play as many games as he really should at Man City. Perhaps that’s due to Mancini..being well, Mancini. It’s quite clear, Roberto loves to shuffle his full backs. But, I love the balance Clichy brings at full back. He defends well, and support attacks pretty effectively too. The Premier League is actually blessed with some very talented defensive midfielders. Looking at the stats, it’s hard. It’s like choosing a chocolate from a Celebrations tin. There are too many tasty, yet different types of defensive midfielders. But I will go for Mikel Arteta. His passing, composure and ball retention is absolutely key in that role. Furthermore, his tackling isn’t that bad either. The Spaniard is a resilient leader who really gets his teams to tick and can often dictate the tempo of games. Something which I feel Carrick, Parker and Barry struggle to do. 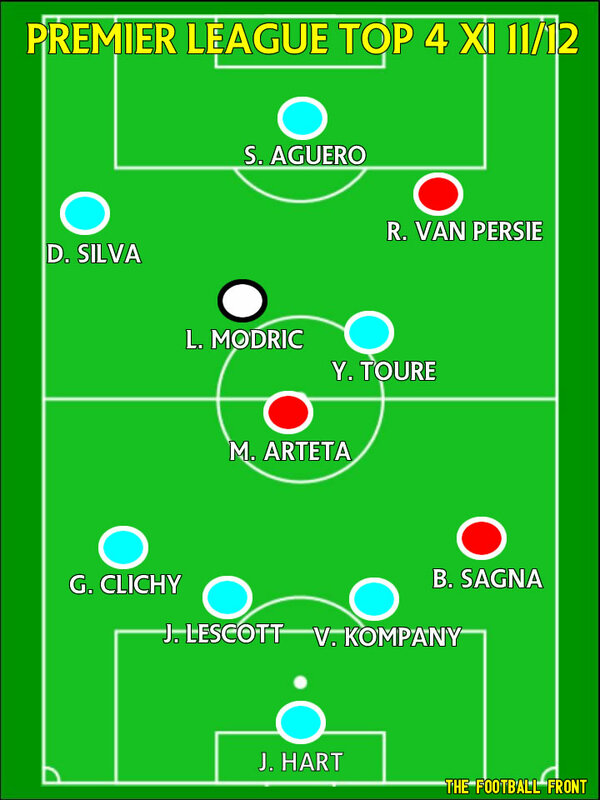 Yaya Toure has to be in this side, without a doubt. One could easily argue, Toure is the best box to box midfielder in the world. Toure has the characteristics to dominate games and he’s proven time and time again he is the man who can make the difference for Man City. One of the things I admire about Toure is his vision and passing abilities, they compliment physicality and the dominant stature he has. Toure’s partner in this midfield is no other than the great Luka Modric. I feel both players would link well together. Modric’s movement and passing range would bring a slickness and fluidity the side. While Toure’s physicality would give the side a bit of drive. David Silva – He has got to be in the team hasn’t he? David Silva is like the bread of a sandwich, he is the one who completes the team. He is the one gives the team texture. David Silva’s quick feet, agile style and his creativity make him imperative for this team. The Spaniard is class, he makes creating chances look like a simple task. David Silva is silent, but deadly. Seeing there are so many quality strikers and wingers in the Premier League, it’s hard to pick someone, over another talented player. As you can go with someone like Nani, and think, ‘yeah, he’s a good player.’ Then later you may ponder, what about Bale, his directness, assertiveness and powerful left foot makes him a must have. But, for the attacking right position, I am going for Robin Van Persie. Van Persie is awesome. And let’s be under no allusions, he is a complete striker. He has wonderful feet, great variation in his finishing and can create chances for his team mates too. Van Persie proved last season, if he can stay injury free, he can score for absolute fun. He really can. His positioning, composure and decision making is first class. Originally, I wanted to compare Aguero, Rooney and Van Persie to each other, but I liked them so much I wanted them all in the team. It was a bit self indulgent of me, it’s like finishing that whole box of celebrations by myself. But I have gone for Sergio Aguero up front. This man is sensational. 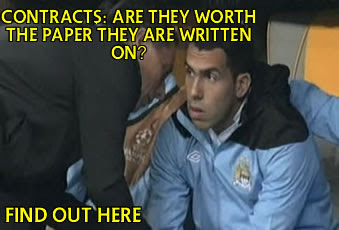 I think his price tag has made people not recognise how crucial he was last season for Man City. People forget, he joined the club aged 22. In his debut season in English football, he scored an impressive 23 league goals. And if you watched him with Man City, he was fully embedded into the side. His understanding and vision of the game was complimented by his City team mates. Aguero himself bagged 8 assists too, a symbol of his cohesion in the team. One aspect of Aguero’s game which impressed me was his physicality. Although he may not be the biggest player, he certainly stood his ground and led the City line very effectively. So here's how the team would look on paper.